Prague, Czech Republic is truly glorious. Described as one of the most beautiful cities in the world, it also has been a cultural and economic center throughout much of European history. Among the wonders of this ancient city is the Vltava River that winds by Old Town. The river is a source of transportation; power, supplying much of Prague’s electricity; and also a major source of commerce. 18 bridges span the width of the Vltava. Most prominent of these bridges is the massive Charles Bridge. Built in the gothic style, construction began in 1357 and was completed in the early 1400s. It is offers majestic views of the city and serves as a promenade for locals and tourists. The bridge is approximately 33 feet wide and provides a venue for artists and vendors of all sorts. The Old Town Bridge Tower, completed in 1380, is one of three watch towers guarding the bridge. It was originally designed and built as part of the city’s fortifications to guard the Old Town from invaders. Now it watches over locals and visitors with more peaceful plans-shopping and celebrating life. In addition to the commercial, military and tourist uses of the bridge, it also has a significant religious place in the life of the community. 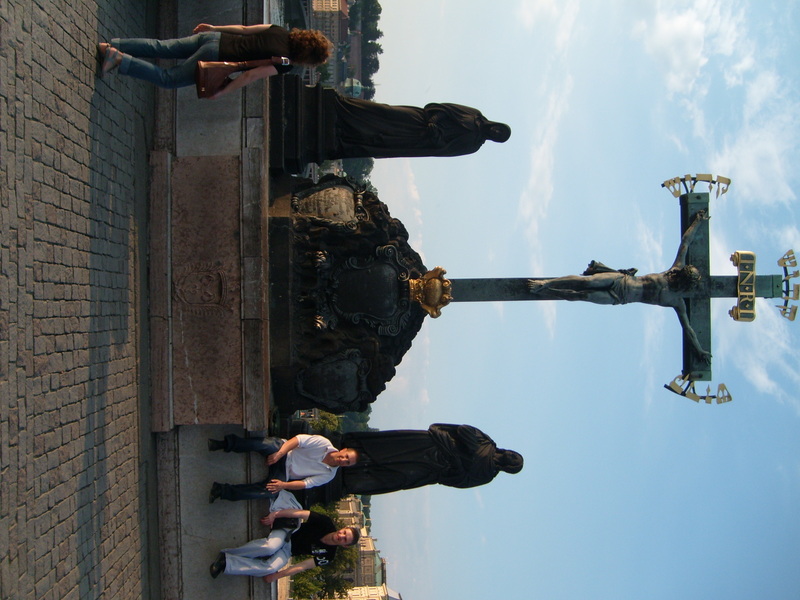 Thirty statues mounted on the Charles Bridge sit in two rows, one row on each side of the Bridge. St. Francis of Assisi, St. Wenceslas, St. John the Baptist and St. Francis Xavier are among those depicted on the statues. An elaborate statue of Christ on the Cross dominates the rest. This sculpture replaces earlier statues of Christ erected since the 1300s. The two figures depicted here below the cross are of the Virgin Mary and John the Baptist. If a visitor to Prague had only one day to spend in the city, the bridge itself would be among the “must see” sites. Prague Castle, the Jewish Cemetery and Old Town itself would also be on my must see list. All are easily accessible and within minutes of the bridge. What are you waiting for? 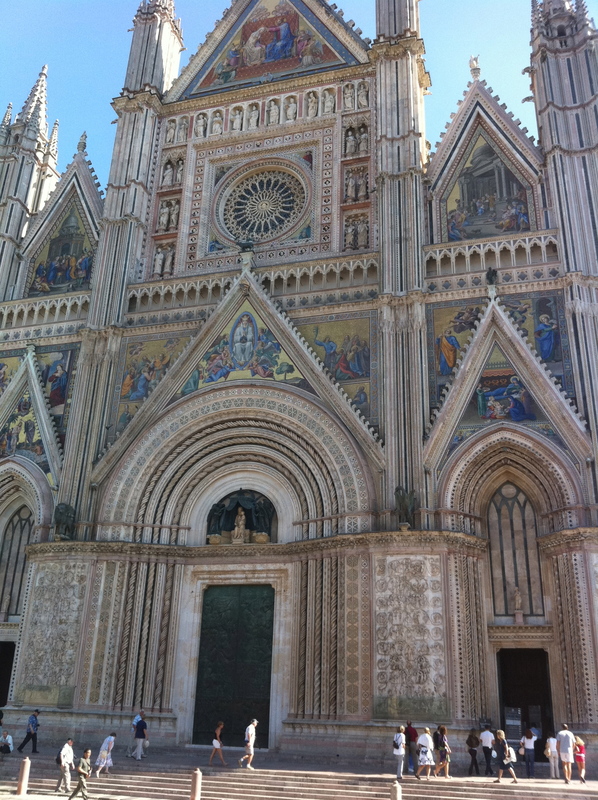 The Duomo at Orvieto is considered one of central Italy’s most beautiful cathedrals. The construction of the massive structure extended for more than 3 centuries. The cornerstone of this magnificent cathedral was laid in 1290 A.D. by Pope Nicolas IV. He wanted a place to house a “miracle”, the Corporal of Bolsena. It is strikingly beautiful. Colorful murals and statues cover the exterior of the building are by many of the finest artists of the day, including Lorenzo Maitani. The interior of the cathedral has frescoes by such artists as Fra Angelico and Luca Signorelli. The cathedral, completed in the early 1600s, is considered to be a masterpiece of Gothic architecture. The design and intricate detail of the cathedral flow together as the works of art–sculptures, mosaics, frescoes,windows, the carved stone and even the gables–are filled with Biblical scenes. It is truly a work of art.